Home / Archive by category "IT Pro"
Azure Service Health helps you stay informed and take action when Azure service issues like outages and planned maintenance affect you. It provides you with a personalized dashboard that can help you understand issues that may be impacting resources in your Azure subscriptions. For any event, you can get guidance and support, share details with your colleagues, and receive issue updates. Most importantly, you can configure customizable alerts to automatically notify you of service issues, planned maintenance, and health advisories. Set up your first Azure Service Health alert. Follow best practices in Azure Service Health alerting. Get alerted via mobile push notifications. Integrate Azure Service Health with your organization’s ticketing system, for example, ServiceNow. Understand the differences between Azure Service Health, Azure Resource Health, and the Azure Status page. Set up your Azure Service Health alerts today by visiting Azure Service Health in the Azure portal. GPS Week Number Rollover – Microsoft has you covered! In the late 1990s, the time and date features of computer systems became a topic of high interest for every business, as programmers realized that a simple abbreviation of four digit years to only the last two digits had a fatal flaw – the rollover to the year 2000. But early preparation and remediation ensured that the predicted Y2K disaster never occurred. In much the same way, Microsoft has completed preparations for the upcoming GPS Week Number Rollover to ensure that users of Microsoft time sources do not experience any impact. Azure Service Health helps you stay informed and take action when Azure service issues like incidents and planned maintenance affect you by providing a personalized health dashboard, customizable alerts, and expert guidance. 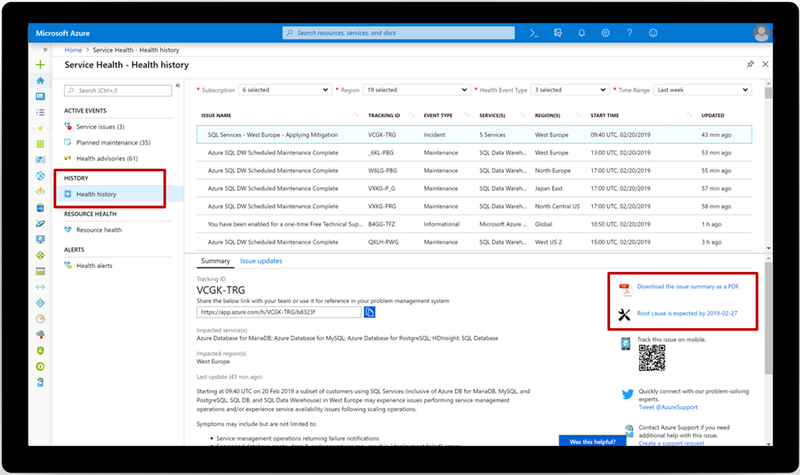 In this blog, we’ll cover how you can use Azure Service Health’s health history to review past health issues and get official root cause analyses (RCAs) to share with your internal and external stakeholders. You can see 90 days of history about past incidents, maintenance, and health advisories in Azure Service Health’s “Health history” section. This is a tailored view of the Azure Activity Log provided by Azure Monitor. If you experienced downtime, your internal or external stakeholders might expect an official report or RCA. As soon as they become available, RCAs can be found under any incident. Meanwhile, you can download and share Microsoft’s issue summary as a PDF. We are pleased to share the general availability of Azure Active Directory (AD) based access control for Azure Storage Blobs and Queues. Enterprises can now grant specific data access permissions to users and service identities from their Azure AD tenant using Azure’s Role-based access control (RBAC). Administrators can then track individual user and service access to data using Storage Analytics logs. Storage accounts can be configured to be more secure by removing the need for most users to have access to powerful storage account access keys. By leveraging Azure AD to authenticate users and services, enterprises gain access to the full array of capabilities that Azure AD provides, including features like two-factor authentication, conditional access, identity protection, and more. 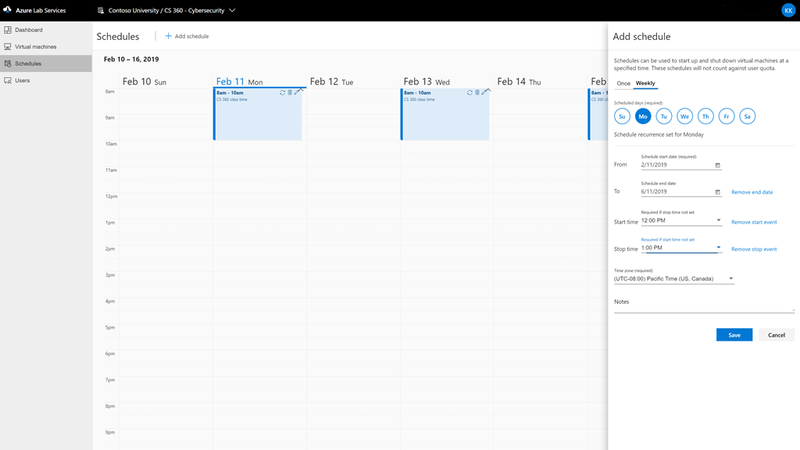 Azure AD Privileged Identity Management (PIM) can also be used to assign roles “just-in-time” and reduce the security risk of standing administrative access. In addition, developers can use Managed identities for Azure resources to deploy secure Azure Storage applications without having to manage application secrets. Self-service is core to Infrastructure-as-a-Service (IaaS). Back in the virtualization days, you had to wait for someone to create a VLAN for you, carve out a LUN, and find space on a host. If Microsoft Azure ran that way, we would have needed to hire more and more admins as our cloud business grew. Let me give you a few examples that show Azure and Azure Stack self-service management of VMs. Creating a VM is as simple as going through a wizard. You can create the VM by specifying everything needed for the VM in the “Create virtual machine” blade. You can include the operating system image or marketplace template, the size (memory, CPUs, number of disks, and NICs), high availability, storage, networking, monitoring, and even in guest configuration. Read the updated Speech Services documentation to get started today. The Speech SDK now also supports Unity in a beta version. 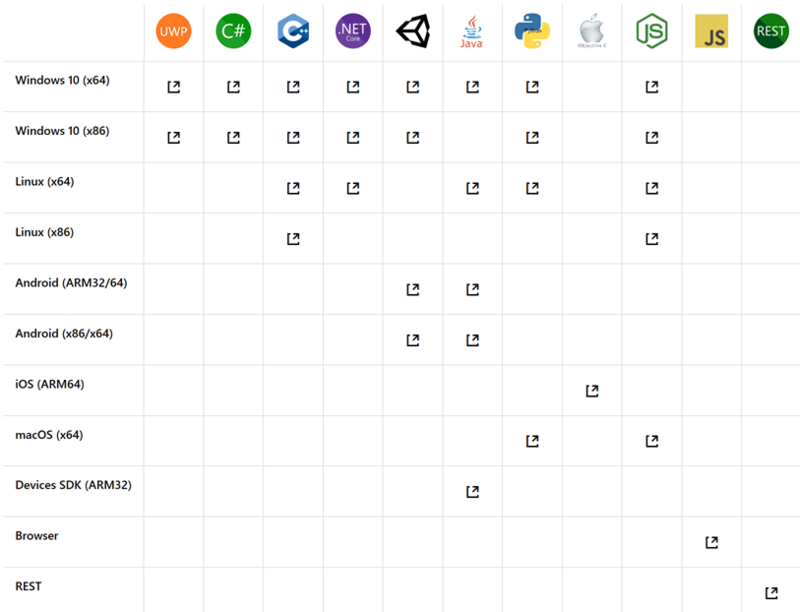 Since this is new functionality, please provide feedback through the issue section in the GitHub sample repository. This release supports Unity on Windows x86 and x64 (desktop or Universal Windows Platform applications), and Android (ARM32/64, x86). More information is available in our Unity quickstart. The following new content is available in our sample repository. This blog post was co-authored by David Armour, Principal Program Manager, Azure Stack. Every organization has a unique journey to the cloud. This journey is based on the organization’s history, business specifics, culture, and maybe most importantly, their starting point. While it can be hard for some to say goodbye to their current virtualization environment and way of doing things, the journey to the cloud provides many options, features, functionalities, and opportunities to improve existing governance, operations, and implement new ones. The journey to the cloud can also provide the opportunity to redesign applications and take advantage of the cloud architecture. 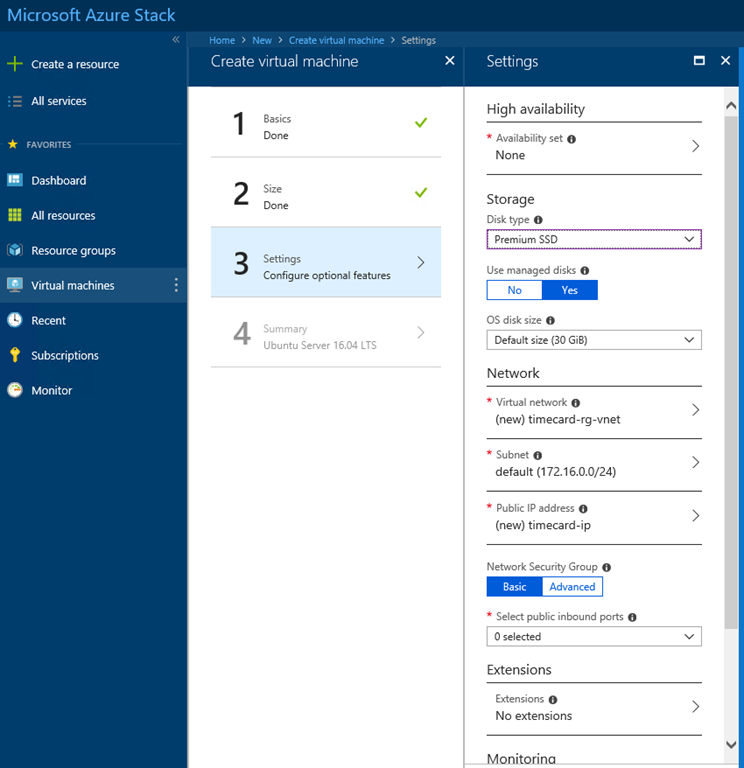 Additionally, Microsoft Azure gives you the option to host your virtual machines (VMs) in the public cloud or in your own facility with Azure Stack. Classroom labs in Azure Lab Services make it easy to set up labs by handling the creation and management of virtual machines and enabling the infrastructure to scale. Through our continuous enhancements to Azure Lab Services, we are proud share that the latest deployment now includes added support for class schedules. Schedules management is one of the key features requested by our customers. This feature helps teachers easily create, edit, and delete schedules for their classes. A teacher can set up a recurring or a one-time schedule and provide a start, end date, and time for the class in the time zone of choice. Schedules can be viewed and managed through a simple, easy to use calendar view. Students virtual machines are turned on and ready to use when a class schedule starts and will be turned off at the end of the schedule. This feature helps limit the usage of virtual machines to class times only, thereby helping IT admins and teachers manage costs efficiently. Schedule hours are not counted against quota allotted to a student. Quota is the time limit outside of schedule hours when a student can use the virtual machine.